Welcome to the internet home of the TVR Car Club of North America, a 501(c)7 non-profit organization chartered in the state of Ohio. We are an organization supported by dues paying members who are charged with promoting the TVR marque, driving our cars as often as possible, and having a good time doing so! So why do you have this page? If you've found our page you're probably here for one of two reasons: 1) you're a TVR owner looking for a community of owners willing to help each other and have fun, or 2) you heard the name TVR or saw one and wanted to learn more about these rare British cars. If you're part of the first group, why not sign up for a membership and then check out our technical articles available to club members. If you're part of the second group, you can start with "What's a TVR?" and work your way through some information on the various models and history of TVR in North America. Either way, thanks for checking out our site and we hope you find what you're looking for. 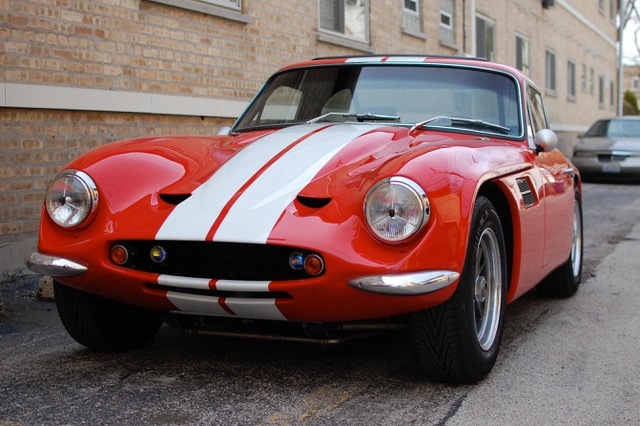 Mark Schaefer's 1971 TVR Vixen 2500. Have a car you'd like to see here? E-mail us a photo and the details. As 2018 winds down it's time for some of us to put our TVRs to bed for their winter hibernation. It was an interesting year for those of us who got rain, rain, and more rain. On to other matters. It looks as though Woodwork 2019 will be at Watkins Glen in conjunction with their vintage Grand Prix. There still are a few details that have to ironed out but everything is on track. If you have never been to Watkins Glen it's a quaint little town at the southern end of Seneca Lake. Aside from the town the lake is surrounded with wineries and breweries and if that isn't enough there are some great roads for cruising and four or 5 museums with an easy drive from the Glen. Our host hotel will be in Horseheads NY about 25 minutes from the track and the Glen. The roads to the Glen are all really nice and twisty back roads with almost no traffic. We will have some sort of a tour/drive on Friday unless I can convince the Glen folks to let us drive the old race course thru town and the surrounding countryside, which might happen. On Saturday we will be at the track either with the existing car show or in our own area, that's still being worked out. Sunday everyone is on their own. Our special guest next year will be John Mieczak. Some of you may remember John from two years ago. I'm hoping to persuade him to handle the auction again. He has told me that he will be bring over lots of TVR related goodies for the auction. OK so much for about Woodwork 2019. In other news the Club will be raffling off a 1986 TVR 280i series II at Woodwork '19, but tickets will go on sale as soon as work out some of the details, pricing and other news will follow shortly.